Hey guy and dolls! Guess who's co-hosting their first event? Here are the deets! 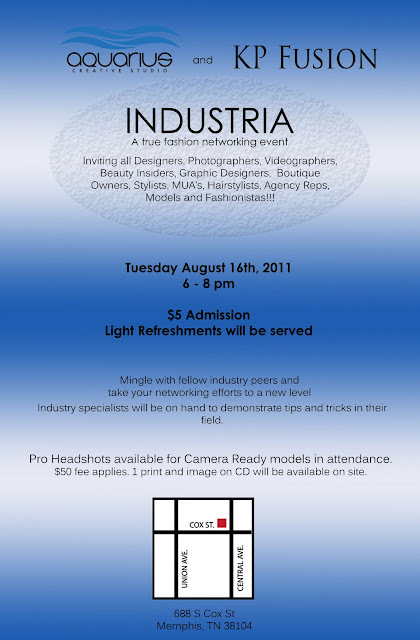 Aquarius Creative Studio & KP Fusion will host Industria: A True Fashion Networking Event from 6 pm- 8 pm on Tuesday, August 16, 2011. Created in an effort to facilitate unity and growth within this dynamic community, Industria will be networking with a purpose.In a city filled with talented people interested in and working within the fashion industry, there is a clear need for events that allow for positive cross-sector communication. Whether you're a designer in need of a photographer or model for your next lookbook, or someone looking for internship opportunities, Industria will serve as a catalyst to help find the right resources for your projects. Held monthly, industry specialists will be on hand to demonstrate tricks and tips in their field. Pro Headshots will be available for camera-ready models in attendance. $50 fee applies. One (1) print and image on CD will be available on site.